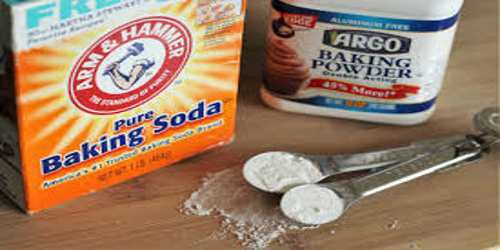 Baking powder is a mixture of baking soda, a nonreactive filler, and at least one slightly acidic compound (such as cream of tartar). 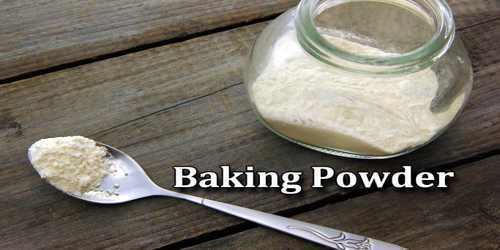 Baking powder works as a leavening agent in baking by releasing carbon dioxide when mixed with a liquid, such as milk or water. The powder is activated when liquid is added, producing carbon dioxide and forming bubbles that cause the mixture to expand. For this reason, it is important to get your cake mixture into the oven quickly once the ‘wet’ ingredients have been added to the ‘dry’ ingredients. While various baking powders were sold in the first half of the 19th century, the modern variants in use today were discovered by Alfred Bird in 1843. August Oetker, a German pharmacist, made baking powder very popular when he began selling his mixture to housewives. The recipe he created in 1891 is still sold as Backin in Germany. Oetker started the mass production of baking powder in 1898 and patented his technique in 1903. Double-acting: Releases leavening gases on contact with moisture and again during baking. Tartrate: A single-acting powder that releases a volume of gas the instant it touches moisture. Phosphate: A slightly slower-to-react single-acting powder. The most commonly used baking powder is the double-acting, which can be readily found in any grocery store. The other two are becoming increasingly difficult to find. 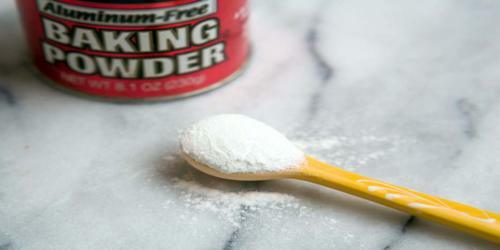 Baking powder is a white solid that typically has three components, including an acid, a base, and filler. When water is added to the baking powder, the dry base and acid dissolve into a solution. In this form, the compounds react to produce carbon dioxide bubbles, however, the amount of carbon dioxide produced by this reaction varies. Baking powder determines the final texture of the food and can affect the flavor, moisture, and overall palatability. 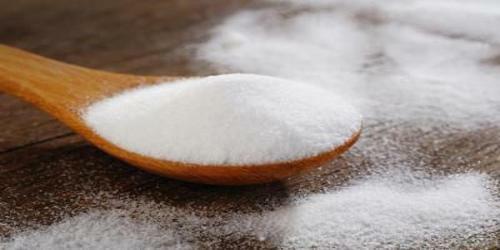 The most common dry base used in baking powders is baking soda, also called sodium bicarbonate. It is a water soluble white crystalline material, and produces carbon dioxide gas by itself when heated above 122°F (50°C). In addition to its use in baking, it is also used in the production of effervescent salts in medicine to prevent excess stomach acidity and in various types of fire extinguishers. Today, there are four major acids used in commercial baking powders including monocalcium phosphate (CaHO4P), sodium acid pyrophosphate (H2Na207P2) sodium aluminum phosphate (H304P), and sodium aluminum sulfate (NaAl08S2). Monocalcium phosphate is a fast reacting acid which produces a large amount of gas within three minutes of its addition to baking soda. Commercial baking powder formulations are different from domestic ones, although the principles remain the same. Instead of sodium aluminum sulfate, commercial baking powders use sodium acid pyrophosphate as one of the two acidic components. Baking Powder is used in recipes that contain no other acidic ingredients, so that the addition of an acidic ingredient like Baking Powder helps to create a balance in the chemical processes that occur during mixing and baking. When sufficient acid exists in the ingredients, then Baking Soda is typically used instead of Baking Powder. It should be kept in an airtight container in a cool dry area away from any type of moisture or heat. Baking powders are available both with and without aluminium compounds. Some people prefer not to use baking powder with aluminium because they believe it gives food a vaguely metallic taste and aluminium is not an essential mineral. Others object because of possible health concerns associated with aluminium intake. Investment and Foreign Exchange Policy of Islami Bank Bangladesh Limited.